After a long wait, the new Nightwish album is finally here. The bands fans have been speculating for months about the album and posting links to "leaked tracks" (inevitably fakes) and excitement has built to such a level that surely the album cannot live up to the level of expectation. Well, after listening to the album I have to say I'm stunned. The album is even better than I'd hoped for - and not just a little bit better - its mindblowingly good. With this album, Nightwish could have played it safe and released something that was similar to Dark Passion Play but with a few improvements, but they havent taken the easy option - they've chosen to go for something that not only contains some stunningly beautiful tracks that Nightwish fans will be comfortable with, but which also contains completely different styles - I definitely heard some Jazz in there. This is an album that sounds fantastic on the first listen, but which also continues to grow on you. I can see the album dividing opinion though - there will be plenty of fans who wanted the album to be full of songs like "Storytime" who won't be comfortable with the variety and vision of the album, but I believe that many of these fans will come round once they give the album a chance - its an album that grows on you rather than being one that everyone falls in love with immediately. Annette's vocals are fantastic and sound much better than on Dark Passion Play - I suspect that as well as her growing into the role there's also the fact that these songs were written with her in mind rather than being written with no particular vocalist in mind. I'm sure there will be a few die-hard Tarja fans criticising the vocals, but frankly they need to get a life - Tarja is never coming back to Nightwish, and whether you prefer her style of vocals or Annette's is frankly irrelevant - this album is better than anything Tarja has released or is ever likely to release (and I say that as someone who loves Tarja's vocals). Storytime is the first single from the album and is probably the closest of all the songs to "traditional" nightwish songs. It's got plenty of power from the guitars, some great vocals from Annette and the orchestra adds an extra level of richness. This is a song that Nightwish fans are going to love. "slow love slow" is a slow song and which has a definte Jazz feel which is quite different to previous albums by Nightwish, but which works amazingly well - Annette really shines here. So overall, how good is it? Well, I got the album a week ago, and despite having a pile of great albums awaiting reviews, I've listened to Imaginaerum almost constantly all week, except for a break to listen to Dark Passion Play to compare the two. There have been a lot of fantastic albums released this year, but for me this blows the competition away and is definitely my top album of the year. 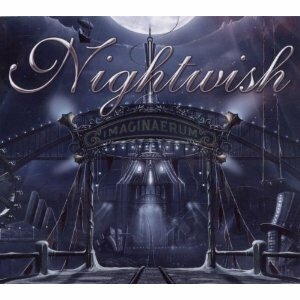 With Imaginaerum, Nightwish have raised the quality bar - not just for themelseves but for all other bands in the genre - this is the album people have to aim to beat, but frankly I can't see anyone making a better symphonic metal album for a long time.